I'm a stacker and a leaner. Yep, I stack and lean things - books, magazines, pictures. 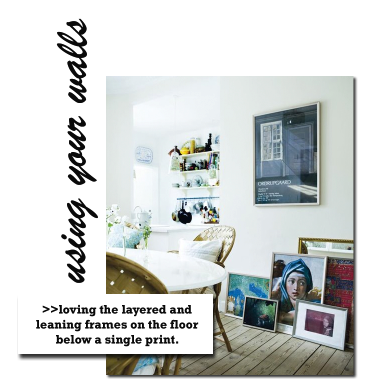 So when I spotted this sweet photo on this lovely blog, I wanted to share it with you as a great interpretation of USING YOUR WALLS by simply using your floors. Living in a small footprint requires a bit of editing and self-control by way of decorating. Instead of overdoing a wall gallery, consider stacking and leaning those pretty frames on the floor. Be open and creative in your small space!